The lensometer is one of the more used optical instruments in the ophthalmology field. This is a device used for checking eyeglass lenses to make sure they are the right prescription. It can check the sphere, cylinder, or axis of a lens. 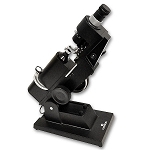 • The Eyepiece; which is just like the eyepiece on a microscope. 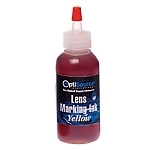 •The Marking Device, which is used to mark a lens with a water soluble marker. •The Lens Stop; for holding the lens in place. • The Aperture; this lets light through to the lens. •The Spectacle Table; eyeglass frames rest here. •The Power Scale; which is a dial on the side that lets you check to see what power the lens is. •The Axis Drum; which you use to check to see what the axis of the lens is. •The Power Switch. If you look into the lensometer you will see three lines bisected by two thinner lines. When a lens is placed in front of the aperture it will blur these lines. When it is adjusted to the correct RX the lines will no longer blur. Ideally when you check the lens against its prescription it should match up to the readings of the lensometer. If that is not the case then the lens are defective and need to be remade. 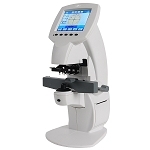 At any optical retail store with ophthalmic instruments this equipment is used to check glasses before they are issued to the customer.